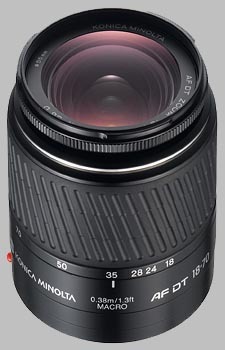 (From Konica Minolta lens literature) An all-purpose lens with a zoom range that extends from wide-angle to telephoto-portrait. Bought it used. Replaced with 18-55 SAM. Still share it with young-shooters. Nice lens. Zoom-range and f/stop are limited by low price point. light, extremely cheap, perfect zoom range for me, decent quality, did I say light? Moderate contrast wide open, okay when stopped down 2 stops. Not the same league as 28-75 or 17-35. The hood is pretty nice as it is included and more effective then those of the 28-75 and 17-35 because it is optimized for DT and not 35mm. Wide open it is a little suspect to veiling flare. Well, when stopped down it is decent. Wide open it is not to good at longer focal lengths. At shorter focal lenghts it only needs one stop down for reasonable sharpness. Not too good, but not entirely shabby either. CA can be a problem with this lens, in contrast to the more expensive 28-75 and 17-35. It can be easily fixed in software. The build is too light for my liking. The front rotates while focusing, but I don't mind, just as I don't mind the extremely shabby focusring. It's simply not important for how I use this lens (travel and general purpose use). I always AF and don't use a polarizer with this lens. It's rather anoying that the maximum aperture is already f5.6 at 28~35mm. I use this more often than I like, having also the excellent 28-75 and 17-35. It especially keeps the 17-35 more in the bag than it should. This is mainly because the focal length range is perfect for my travel and general purpose needs. It takes decent pictures, so for the price you pay second hand or in a kit, it's just perfect! However, I like my lenses a little heavier, a little better build and a lot more consistent throughout the zoom- and apperturerange. I simply don't like stopping down for image quality, for depth of field yes, for image quality no. So I'm looking at replacing this and my 17-35 for a Tamron 17-50 2.8 or Sigma 17-70 2.8-4.5. For the price and as a place to start/beginnerlens it's pretty perfect! Recommended!